Power carving is on the increase and there are many types of power carving. 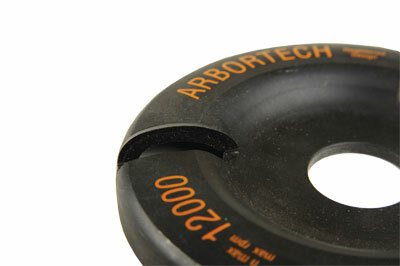 One such type requires the use of an angle grinder to which is fitted abrasive discs/cutters of various types. Yes, you can use standard abrasive discs available for all kinds of material, but the initial shaping is typically done with discs with carbide teeth/cutters on them. Here we look at a brand new 115mm (4 1/2in) angle grinder from Bosch - the 9-115 with new vibration-reducing auxillary handle and a brand new blade design from Arbortech called the TURBOPlane. The TURBOPlane can be fitted to 100-115mm (4-4/12in) angle grinders. 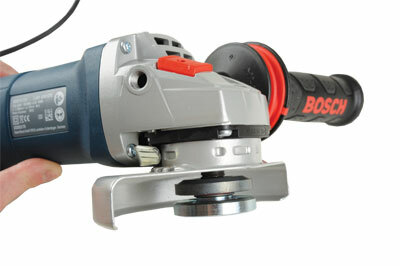 They say there is nothing new under the sun, but Bosch as usual have managed to put a new spin on a well worn favourite with the introduction of the GWS 9-115 angle grinder. It has several features that improve on the basic pattern. Firstly, it is high powered at 900W for a small grinder. Secondly, the snap lever adjustment for the guard, once you get used to it, makes for easy, secure positioning without slippage or recourse to a easily lost Allen key. The handgrip features a flexible section for more comfort and less vibration under load. It has a spindle lock but you still need the two-pin spanner for disc changing. We used this tool for working with an Arbortech TURBOPlane for power carving and the removal rate can only be described as rapacious. 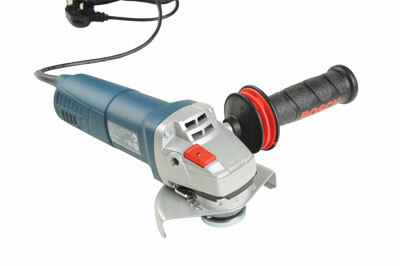 Bosch make a variety of cutting discs for stone, metal and wood but when sculpting wood, etc. loading it with a toothed wood cutter is great. No beef with this machine, well sorted and efficient. A good work partner. 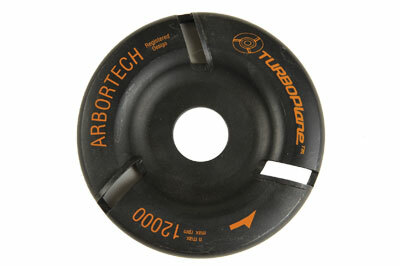 The TURBOPlane is a valuable addition to the Arbortech cutter range, the Pro 4 and industrial mini TCT cutter are items we have used extensively so we were intrigued to find out what this cutter could do. In short, There are three TCT cutters set into a disc of steel. The cutters have an elongated radius which has a flattish curve on the top arcing down to a tight-radius curve on the outer edge. This profile, depending on how it is presented to the wood, allows you to make heavy shaping cuts, but also very fine 'planing cuts' to clean the surface of the wood. This cutter is versatile and easy to sharpen, although we have not had reason to do that yet even after using it extensively on oak (Quercus robur) and beech (Fagus sylvatica). Simply use a diamond hone rubbed across the flat vertical face of the TCT cutters. Of course, you have to be careful when using such cutters - always wear appropriate clothing and be sure you present the cutter to the work in the right manner and always read the instructions. That said, this is a nice and simple cutter to use and I didn't experience any dragging or grabbing when using it. The finish achievable off this cutter is quite something. Depending on the wood used, it can leave a very clean finish requiring only the lightest of sanding to finish it off. A nice bit of kit to shape and sculpt wood easily that no doubt will last a long, long while.